Abstract: Numerous small deposits and occurrences of Mn-Fe-fluorite-barite mineralization have developed at the contact of the Thuringian Basin, Thüringer Wald and Thüringer Schiefergebirge in central Germany. The studied mineralizations comprise the assemblages siderite+ankerite-calcite-fluorite-barite and hematite-Mn oxides-calcite-barite, with the precipitation sequence in that order within each assemblage. A structural geological analysis places the origin of the barite veins between the Middle Jurassic and Early Cretaceous. Primary fluid inclusions contain water vapour and an aqueous phase with NaCl and CaCl2 as the main solutes, with salinities mostly between 24—27 mass. % CaCl2 eq. Th measurements range between 85 °C and 160 °C in barite, between 139 °C and 163 °C in siderite, and between 80 °C and 130 °C in fluorite and calcite. Stable isotopes (S, O) point to the evaporitic source of sulphur in the observed mineralizations. The S,C,O isotopic compositions suggest that barite and calcite could not have precipitated from the same fluid. The isotopic composition of the fluid that precipitated barite is close to the sea water in the entire Permo— Mesozoic time span whereas calcite is isotopically distinctly heavier, as if the fluids were affected by evaporation. The fluid evolution in the siliciclastic/volcanic Rotliegend sediments (as determined by a number of earlier petrological and geochemical studies) can be correlated with the deposition sequence of the ore minerals. In particular, the bleaching of the sediments by reduced Rotliegend fluids (basinal brines) could be the event that mobilized Fe and Mn. These elements were deposited as siderite+ankerite within the Zechstein carbonate rocks and as hematite+Mn oxides within the oxidizing environment of the Permian volcanic and volcanoclastic rocks. A Middle-Jurassic illitization event delivered Ca, Na, Ba, and Pb from the feldspars into the basinal brines. Of these elements, Ba was deposited as massive barite veins. Abstract: Planktonic and benthic foraminifera are described from the Middle Eocene-Lower Miocene successions inthe Sivas Basin, Central Anatolia. An integrated foraminiferal zonation provides new age assignments in terms of a great number of taxa for the studied sections. Four biostratigraphical intervals are first recorded based on the concurrent ranges of sporadically occurring but well preserved planktonic foraminiferal assemblages. The first interval characterized by the co-occurrences of Acarinina bullbrooki, Truncorotaloides topilensis and Turborotalia cerroazulensisis referable to the E11 Zone of late Lutetian—early Bartonian. An assemblage yielding Paragloborotalia opima accompanied by Globigerinella obesa forms a basis for the late Chattian O5 Zone. The successive interval corresponds to thelate Chattian O6 Zone indicated by the presence of Globigerina ciperoensis and Globigerinoides primordius along withthe absence of Paragloborotalia opima. The early Aquitanian M1 Zone can be tentatively defined based mainly on theassemblage of Globigerina, Globigerinella, Globoturborotalita and Tenuitella. The biostratigraphical data obtainedfrom the benthic foraminifera assign the studied sections to the SBZ 21—22, SBZ 23 and SBZ 24 ranging in age fromRupelian to Aquitanian. The SBZ 23 and 24 are well constrained biozones by the occurrences of Miogypsinella complanataand Miogypsina gunteri, respectively, whereas the SBZ 21—22 defined by nummulitids and lepidocylinids in the Tethyan Shallow Benthic Zonation is characterized dominantly by peneroplids, soritids and miliolids in the studied sections.Benthic foraminiferal assemblages suggest different paleoenvironments covering lagoon, algal reef and shallow openmarine whereas planktonic foraminifera provides evidence for relatively deep marine settings on the basis of assemblages characterized by a mixture of small-sized simple and more complex morphogroups indicative for intermediatedepths of the water column. 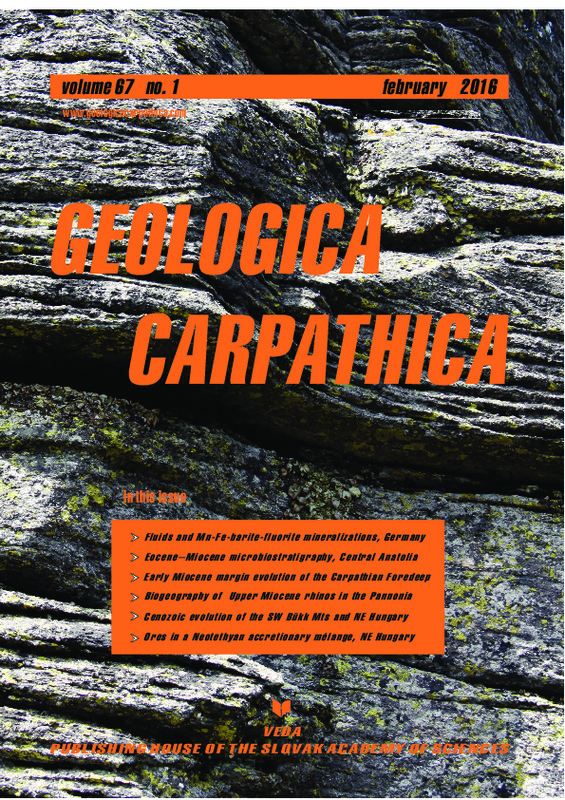 Abstract: The Karpatian deposits of the central part of the Carpathian Foredeep in Moravia, which are deeply buried under the Outer Western Carpathians, provide a unique opportunity to reconstruct the former evolutionary stages of this peripheral foreland basin and its paleogeography. A succession of three depositional units characterized by a distinct depositional environment, provenance, and partly also foreland basin depozone, have been identified. The first depositional unit represents a proximal forebulge depozone and consists of lagoon-estuary and barred coastline deposits. The source from the “local” crystalline basement played here an important role. The second depositional unit consists of coastline to shallow marine deposits and is interpreted as a forebulge depozone. Tidalites recognized within this unit represent the only described tide-generated deposits of the Neogene infill of the Carpathian Foredeep basin in Moravia. The source from the basin passive margin (the Bohemian Massif) has been proved. The third depositional unit is formed by offshore deposits and represents a foredeep depozone. The provenance from both passive and active basin margin (Silesian Unit of the Western Carpathian Flysch Zone) has been proved. Thus, both a stepwise migration of the foredeep basin axis and shift of basin depozones outwards/cratonwards were documented, together with forebulge retreat. The shift of the foreland basin depozones more than 50 km cratonward can be assumed. The renewed thrusting along the basin’s active margin finally completely changed the basin shape and paleogeography. The upper part of the infill was deformed outside the prograding thrust front of flysch nappes and the flysch rocks together with a strip of Miocene sediments were superposed onto the inner part of the basin. The width and bathymetric gradient of the entire basin was changed/reduced and the deposition continued toward the platform. The basin evolution and changes in its geometry are interpreted as a consequence of the phases of the thrust-sheet stacking and sediment loading in combination with sea- level change. Abstract: Although the rhinoceros remains have high biochronological significance, they are poorly known or scarcely documented in the uppermost Miocene deposits of Europe. Several specimens collected from the Upper Miocene (around 7.0 Ma, Turolian) deposits of Kávás (Pannonian Basin, Western Hungary), previously determined as Rhinoceros sp., are revised and described in this paper. The postcranial remains of these specimens belong to “Dihoplus” megarhinus (de Christol) on the basis of the morphological and morphometric characters of humerus, radii, metacarpal and metatarsal elements. An overview of rhinoceros remains from several uppermost Miocene localities and the revision of the rhinoceros material from the Pannonian Basin suggest that “D.” megarhinus spread during the latest Miocene from the Pannonian Basin towards Italy. The occurrences of this species in Western Hungary and Italy during the latest Miocene further imply that Rhinocerotini species were biogeographically segregated between Western, Southern and Central Europe. Abstract: Extensive structural field observations and seismic interpretation allowed us to delineate 7 deformation phases in the study area for the Cenozoic period. Phase D1 indicates NW—SE compression and perpendicular extension in the Late Oligocene—early Eggenburgian and it was responsible for the development of a wedge-shaped Paleogene sequence in front of north-westward propagating blind reverse faults. D2 is represented by E—W compression and perpendicular extension in the middle Eggenburgian—early Ottnangian. The D1 and D2 phases resulted in the erosion of Paleogene suites on elevated highs. Phase D2 was followed by a counterclockwise rotation, described in earlier publications. When considering the age of sediments deformed by the syn-sedimentary D3 deformation and preliminary geochronological ages of deformed volcanites the time of the first CCW rotation can be shifted slightly younger (~17—16.5 Ma) than previously thought (18.5—17.5 Ma). Another consequence of our new timing is that the extrusional tectonics of the ALCAPA unit, the D2 local phase, could also terminate somewhat later by 1 Myr. D4 shows NE—SW extension in the late Karpatian—Early Badenian creating NW—SE trending normal faults which connected the major NNE—SSW trending sinistral faults. The D5 and D6 phases are late syn-rift deformations indicating E—W extension and NW—SE extension, respectively. D5 indicates syn-sedimentary deformation in the Middle Badenian—early Sarmatian and caused the syn-sedimentary thickening of mid-Miocene suites along NNE—SSW trending transtensional faults. D5 postdates the second CCW rotation which can be bracketed between ~16—15 Ma. This timing is somewhat older than previously considered and is based on new geochronological dates of pyroclastite rocks which were not deformed by this phase. D6 was responsible for further deepening of half-grabens during the Sarmatian. D7 is post-tilt NNW—SSE extension and induced the deposition of the 700 m thick Pannonian wedge between 11.6—8.92 Ma in the southern part of the study area. Abstract: The geology of the NE Hungarian Darnó Unit is rather complicated, as it is composed mostly of a Jurassic accretionary mélange complex, according to the most recent investigations. The magmatic and sedimentary rock blocks of the mélange represent products of different evolutionary stages of the Neotethys; including Permian and Triassic sedimentary rocks of marine rifting related origin, Triassic pillow basalt of advanced rifting related origin and Jurassic pillow basalt originated in back-arc-basin environment. This small unit contains a copper-gold occurrence in the Permian marly-clayey limestone, an iron enrichment in the Triassic sedimentary succession, a copper-silver ore occurrence in Triassic pillow basalts and a copper ore indication, occurring both in the Triassic and Jurassic pillow basalts. The present study deals with the Cu(-Ag) occurrence in the Triassic basalt and the Fe occurrence in the Triassic sedimentary succession. The former shows significant similarities with the Michigan-type mineralizations, while the latter has typical characteristics of the Fe-SEDEX deposits. All the above localities fit well into the new geological model of the investigated area. The mineralizations represent the different evolutionary stages of the Neotethyan rifting and an epigenetic, Alpine metamorphism-related process and their recent, spatially close position is the result of the accretionary mélange formation. Thus, the Darnó Unit represents a perfect natural laboratory for studying and understanding the characteristic features of several different rifting related ore forming processes.